BSaaS, your fully scalable One-Stop eBusiness Solution! 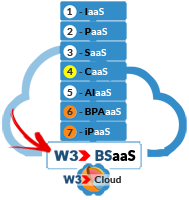 The W3 Business Solution as a Service (BSaaS) App is a cloud-based end-to-end eBusiness solution that incorporates ALL of today's most popular Cloud-based computing services, including; 1-IaaS, 2-PaaS, 3-SaaS, 4-CaaS, 5-AIaaS, 6-BPAaaS & 7-iPaaS to empower business owners (Channel Partners) with the tools, technology, content and business know-how to quickly and easily launch, run and operate their entire end-to-end business via the Cloud using W3's ALL inclusive cloud-based eBusiness Solution. It's the EASIEST, FASTEST and most SCALABLE one-stop end-to-end eBusiness Solution on the market. 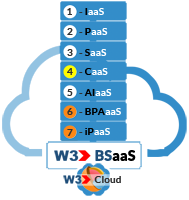 When you combine today's top cloud computing services (1-IaaS, 2-PaaS, 3-SaaS, 5-AIaaS, 6-BPAaaS & 7-iPaaS) in collaboration with Content Owners (4 - CaaS), you're able to provide Industry specific Channel Partner Solutions using W3's ALL-INCLUSIVE Business Solution as a Service (BSaaS) Apps. 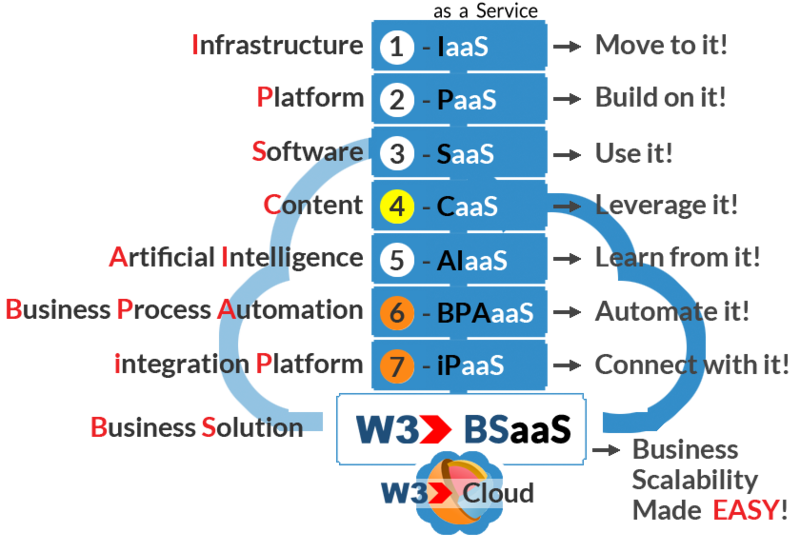 W3's BSaaS App offer organizations with a one-stop turn-key eBusiness Solution that can empowers Channel Partners with ALL the tools, technology and business know-how they need to run their businesses better in the Cloud through a SINGLE APP! To make it EASIER on Channel Partners to help you grow your business, get started by creating your own CaaS Catalog and then launch your own BSaaS App.